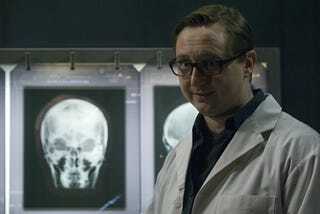 Wondering just how professional expert John Hodgman ended up using his medical expertise on Friday's Battlestar Galactica? Showrunner and producer Ronald D Moore explained on the show's official podcast. John's a friend of ours, and a friend of mine and my wife, and we've known him for a few years now. Of course, he has his own very successful career and John was a fan of the show. It was, we really wanted to find something for him to do [on the show]. I think we almost had a role for him to do, I think it was some point last season, I want to say... And then that fell through for scheduling reasons or whatever. And then this [role as Anders' surgeon] came up, and I think it was Jane's... I think it was [producer] Jane Espenson's idea to tap him for this role and I jumped on it, and thought it would be great to have him in this small [role] because it's such a fun little beat as the brain surgeon... Sort of give him just a... taste of something comedic in all of this. Also mentioned in the podcast commentary: Cavil will play a large part in The Plan, the final BSG TV Movie, which will shed some more light on his behind-the-scenes machinations against the final five cylons, and "Daniel," the newly revealed eighth cylon isn't necessarily important to the remainder of Galactica, but may be part of spin-off Caprica.